We continue posting our trading and investing results in 2019. Our strategy is simple: trade options to generate income and invest 50% of that income into dividend growth stocks. We post these trades on our Facebook page where you can follow them. You can also subscribe to our trade alerts text messages so if you want to follow our trades, you get the information faster than waiting for the Facebook post to appear. If you want details go to this post on our Facebook page to learn more. You can also review our open and closed trades in our trades list. We would like to post our trades for all to see and eventually follow. We believe that it can be helpful mainly to novice traders to see the trades, follow them, and mirror them. The best way to learn trading options is by doing it. Before you start mirroring our trades, please make sure you read and understand our strategy and how we trade options. It is important that you know the strategy before you commit your money in a trade and that you understand that trade. To trade options successfully you must understand the initial trade and its setup, all possible outcomes of that trade, and your “repair” strategies to all those outcomes. It is not always easy to repair a trade. But you must know what to do when that happens and a trade needs a repair. Before you commit real money, we recommend that you place those trades in you paper money account and practice trading first to understand. And of course, you can ask us any questions about the trade. In the past, we experimented with several way on how to post the trades and keep track of them for our readers and followers to best mirror the trades. We did this manually and with the amount of trades, it became impossible to maintain our trades public. But we will keep looking for the best way to publish our trades and show its status so you can follow it the best. As of today, it seems that the best way to publish our trades (and it still may change over time) is to use Facebook page. So we set up a page ZZ Capital 14 where you can follow the trades. A part of our strategy is to use 50% of our income from trading options to purchase dividend growth stocks (dividend aristocrats) and build our portfolio of dividend stocks. Every month, if we have profits from options trading, we purchase shares of a dividend aristocrats. Currently, we have a $500.00 minimum stock purchase limit, so if we make at least $1,000 profit per month we use $500 to purchase the stocks. If there are no profits or smaller than the limit, we keep it in the account and reinvest in options trading. To see the entire history and life of each trade, go to our Facebook page! I started recording all accounts progress towards financial freedom, not only our business account. Here are the results of our accounts. This table is updated at the end of each month. Your income consistency is impressive and I love your 401K comments :) Sadly, most aren’t aware of the fess nor do that pay attention to the tax trap nature of them. I wish you much more success and I look forward to reading more from you. I see you didn’t max out your 401K, are you the invest up to the matching % camp, then invest the rest in the taxable account or Roth IRA camp? My husband is like that, he doesn’t trust the government will keep the taxing the same by the time he’s retired. I see that your montly option income can be a living wage with so little money involved, compare to me having to pour everything in real estate to generate a little more. Do you have posts on how to do option? I still don’t fully understand it, I just know people can lose everything if the wind blow the wrong way, but optionhunting.com, you and a lot of other blogger seem to make tons of money on option. 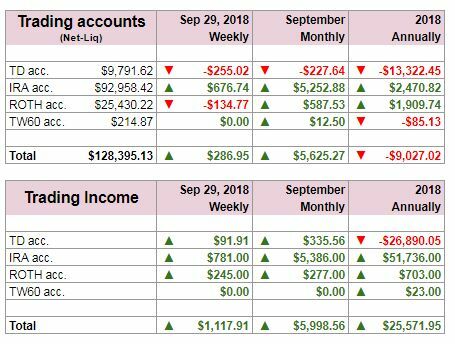 Hi Martin, I am a beginner and I have an account on TD Ameritrade , I have been reading and browsing the web until my friend recommended me this site. I read the articles that you have posted and the strategies that you have recommended. But, since I’m a beginner I would love if you could give me some advice and strategies for what to do to continue to reproduce my money. I recently bought a stock (RAI) and it has been doing well. Can you help me? Hello Hailey, thank you for stopping by and commenting. Of course I can help you your investing/trading. RAI is a fairly good dividend stock and it is definitely a good addition to your portfolio. That brings one very important thing you need to do before you commit any money – define your strategy and stick to it. If you are investing for a long haul and your target horizon is next 25 – 30 years, then you choose around 20 high quality dividend growth stocks (create a watch list of those stocks) and then invest in each one by one and use DRIP program to reinvest those dividends. If you stick to this simple strategy, accumulate into 20 high quality dividend stocks, reinvest dividends, you will experience a compounding return on those stock and you will be surprised how quickly and fast your portfolio will grow over time. It will not be visible at first, but 10 years from now you will see a huge progress. The goal is to save and invest regularly and stick to the plan. Ignore any noise in the market, any panic, sell offs or euphoria and stick to the plan. It will pay off. I am using the very same strategy cash secured Naked Puts to (touchwood) very profitable end since the implosion earlier this year. In addition I am playing large defensive Covered calls as well CC ITM for 2 weeks expiry and getting assigned every expiry, this is also profitable but completely safe. I am not trading those puts cash secured but naked. Well, sort of. I use margin but make sure I have capital for assignment, but margin capital, so I do not have to hold the entire cash. I am looking for optimal entry and exits, I have to disagree with your spread analysis. Though I do agree that breakevens are deeper with wider spreads, you have to take time value into account. So say a +1950/-1960 Put is in play on Monday , expiring Friday , SPX is at 1958, intrinsic is 2$ whereas extrinsic can easily be another 2$. This most likely will be more than credit received. Your analysis of breakeven is at the time of expiry, and no one knows what the spread performance is at expiry especially since the short 1960 has already been breached on Monday itself. Only closer to expiration will delta equal 1. Rather you go farther and play shorter widths, return on Margin is much better. A 5$ wide spread means 500$ of margin hold whereas 10$ is 1000$. If you decide to exit consistently on 50% profit then 5$ spreads will win with the additional advantage of risk mitigation. Another point is with your 7 step ladder, after looking at the performance you lost 96% during the Aug/Sept market implosion. Your trades are 77% successful but the losses easily outweighed the gains. I have to say this is the biggest disadvantage of farther DTE trades. What I’ve noticed is that macro factors are just too dangerous to ignore, like this week. You would never have known it 7 weeks ago. I think 2 week intervals are better – though premiums are lower the ability to quickly exit a trade or place a trade is better. Here is an e.g. you place the 7 wk ladder trade, wk 5 6 and 7 are now approaching and a breach occurs during wk 5 , there is now a higher probability that weeks 6 and 7 are also under threat, compounding your Buy back premiums. So should you decide to exit, your loss is compounded for 3 weeks. To be honest I dont even think 2 week rotation is a better strategy but I find that it can be better controlled especially if consistent winners is the key. One more thing, my losses recently are not related to the spread width but my attempts to save losing trades by rolling them or converting into a different trade. Instead of taking a small loss I rolled the trade, increased the risk, and it worked at some trades but some didn’t and instead of taking a small loss I was forced to take a large one. Mike, thank you for your comment. 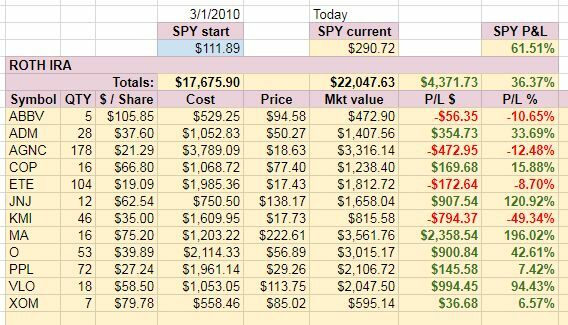 Some things you mentioned I learned myself the last August, so as of now I am not applying the ladder trades until I sort it out. I realized I was trapped with 6 trades with losses and had to decide whether to close them roll them or wait them out. Basically none worked. So as of now I am limiting myself to only one trade at a time. As the width goes, I am also comparing it with number of contracts = what is better? (2) $500 contracts or (1) $1000 contract? At both occasions you risk $1000, your commission is higher when selling (2) contracts and the break even point is better for larger spread. True, I was comparing it with at expiration situation, but still, it seems working well to me and allows me to get farther away from the current market than if I do only 5 dollars spread. Awesome… I found https://www.cboe.com/tradtool/virtualtrade.aspx and https://www.trademonster.com/trading/papertrade.jsp wonder if you paper traded with them? tastytrade (www.tastytrade.com) has some excellent options education videos. See also dough (http://dough.com) for great education. I’m working my way through the dough videos right now. Martin, thanks for the book recommendation, I’ll have to check it out! Scott, you are welcome. I think that book is the best one for put selling strategy. Plain English. I appreciate the tips about options. I know writing contracts can really juice a portfolio but just not educated enough to jump into it yet. That’s something you must do at all cost – educate yourself. If you fail to educate yourself, you will lose money. I recommend opening a paper money account and try to trade options there. It helped me a lot before I committed a real cash. I have always wanted to get into options trading and wondered what sites/books you have read to learn more about it. The idea of covered call writing sounds appealing but I wonder about being exercised and having to give up my shares for the premiun collected. Have you ever had to sell your stock because an option contract was exercised? that was the reason why I never or very rarely used covered calls against my core stocks, but always was looking for stocks which I didn’t mind to be called away. I was doing the total return or buy-write covered calls – I bought the stock and wrote a call against it. 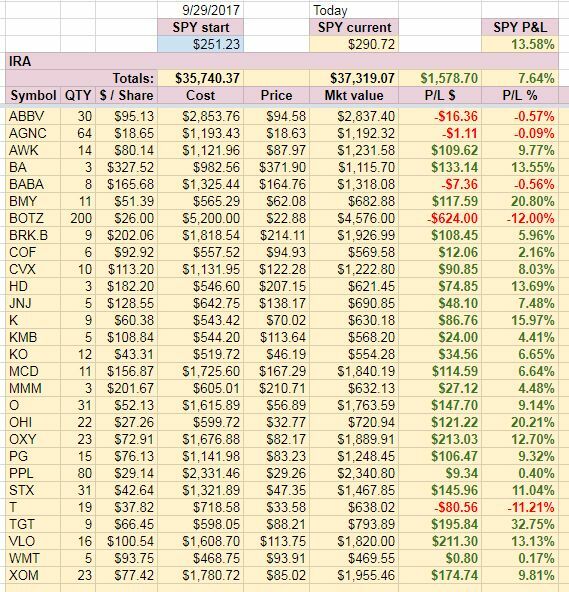 In My Trades & Income the previous year and use links for covered call trades where I explain them. As far as put selling, which I consider far better than covered call strategy, you can read Selling put options my way by Jerry Lee and read that one. It is very nice and simply explained way of selling puts. I think it will help you the best.